Effect of PDG on placental apoptosis and immune cell recruitment in vivo. C57BL/6 pregnant mice were treated i.p. with either saline or PDG (25 μg/mouse) in 100 μl on embryonic day 6.5. On embryonic day 12, animals were sacrificed and the spleens and fetoplacental units were harvested. A, Paraffin-embedded placental tissue sections were immunostained for active caspase 3 and cell death using the apoptosis marker M-30. For each treatment (saline or PDG) and marker (caspase 3 and M-30), panels are labeled as: i, Placenta labyrinth (P) and fetal membranes (M) (original magnification, ×10); ii, placenta labyrinth and fetal membranes (original magnification, ×20); iii, placental labyrinth (original magnification, ×40); and iv, fetal membranes (original magnification, ×20–40). Insets show the Ab-negative controls (Neg). B, Placental tissue lysates were evaluated for activation of the caspase pathway using the Caspase-Glo assay. Bar graphs show caspase 3, caspase 8, and caspase 9 activities as RLU. Value of p < 0.05 relative to the saline controls. C, The proportion of uterine and splenic NK cells were evaluated using flow cytometry by first gating on the CD45+ cells and then by analyzing CD3, NK1.1, and CD11b expression. As shown on the scatter graphs, the proportion of uterine and splenic NK cells (NK1.1+CD3−) and myeloid cells (CD11b+CD3−) were similar between the mice treated with saline and those treated with PDG. C, Uterine NK cells were isolated and their cytotoxicity was tested against YAC-1 cells. D, Bar graph, Similar levels of uterine NK cell cytotoxicity from mice treated with either saline or PDG. Effect of PDG on trophoblast apoptosis in vitro. A, First trimester trophoblast cells (HTR8 and 3A) were incubated with PDG (0–80 μg/ml) for 48 h, after which cell lysates were prepared and caspase 3 activity was determined using the Caspase-Glo assay. 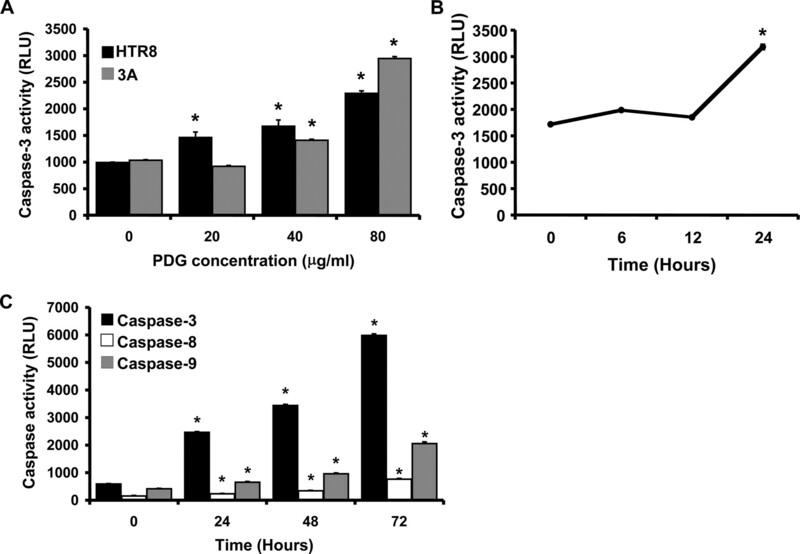 Bar graphs show caspase activity in RLU. 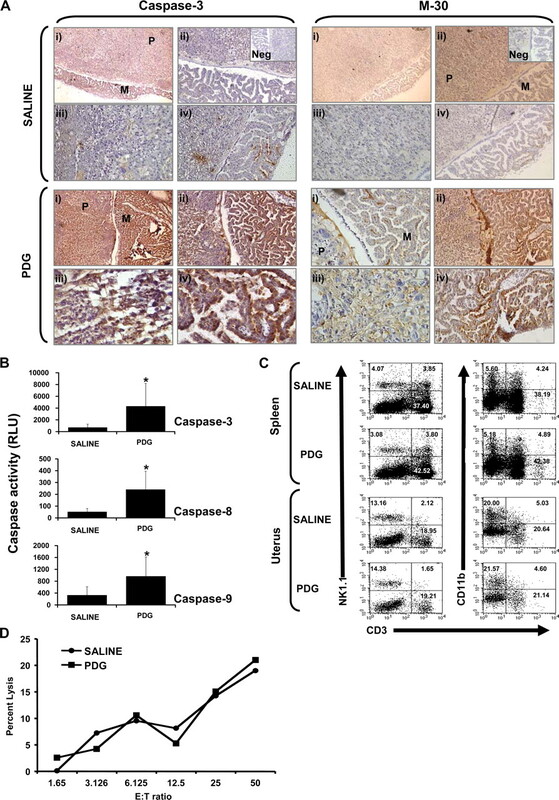 PDG significantly increased trophoblast cell caspase 3 activity in a dose-dependent manner. *, p < 0.001 relative to the untreated control (0). B, First trimester trophoblast cells (HTR8) were incubated with PDG (80 μg/ml) and, after 0, 6, 12, and 24 h, cell lysates were prepared and caspase 3 activity was evaluated. C, First trimester trophoblast cells (HTR8) were incubated with PDG (80 μg/ml). After 0, 24, 48, and 72 h, cell lysates were prepared and caspase 3, caspase 8, and caspase 9 activity was evaluated. PDG significantly increased trophoblast cell caspase activity in a time- dependent manner. *, p < 0.001 relative to time 0. Expression of TLR1-DN or TLR2-DN inhibits PDG-induced trophoblast cell death. Wild-type or the trophoblast cell lines stably transfected with either TLR1-DN or TLR2-DN were incubated with PDG using 0, 40, or 80 μg/ml for 72 h. Cell viability was then determined using the CellTiter 96 assay. Bar graph, Percentage of cell viability relative to the untreated control (0). Treatment with PDG significantly reduced the wild-type trophoblast cell viability in a dose-dependent manner (*, p < 0.05; ***, p < 0.001). There was significantly less PDG-induced cell death in TLR1-DN- and TLR2-DN-expressing trophoblast cell lines when compared with the wild-type cells (*, p < 0.05; **, p < 0.01). Expression of TLR1-DN or TLR2-DN inhibits PDG activation of the caspase pathway. Wild-type or the trophoblast cell lines stably transfected with either TLR1-DN or TLR2-DN were incubated with either no treatment or PDG at 40 μg/ml for 48 h, after which cell lysates were prepared and caspase 3, caspase 8, and caspase 9 activities were determined. Bar graph, The percent increase in caspase activity induced by PDG relative to the untreated control. 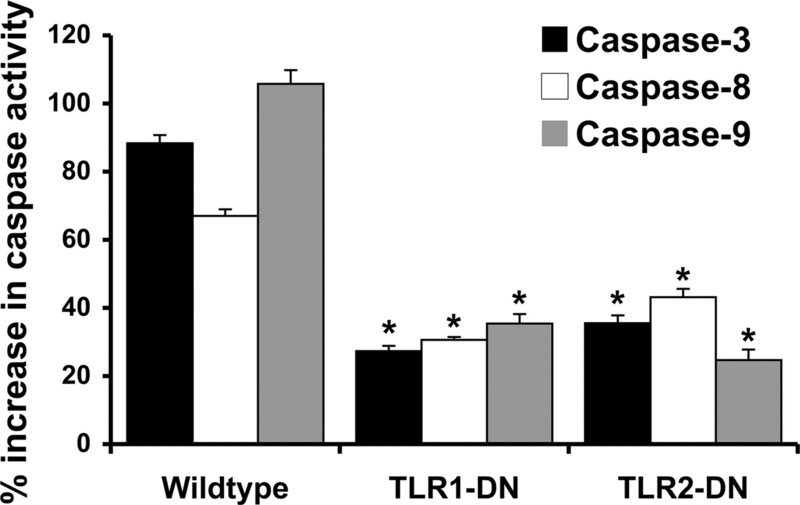 Expression of either the TLR1-DN or TLR2-DN significantly reduced PDG-induced activation of caspase 3, caspase 8, and caspase 9 when compared with the response of the wild-type cells (*, p < 0.001). Expression of TLR6 inhibits PDG-induced trophoblast cell death. 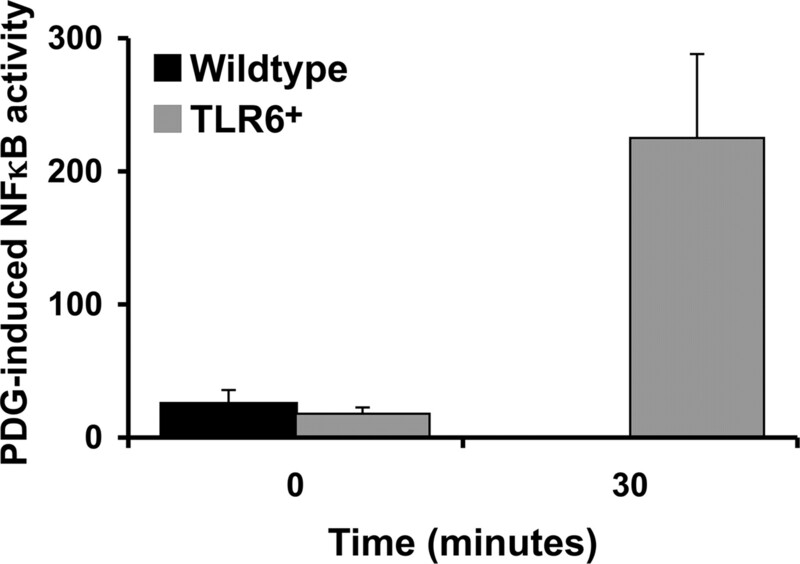 A, TLR6 mRNA expression was evaluated by RT-PCR in the wild-type trophoblast cells and in trophoblast cells stably transfected to express TLR6. Top panel, TLR6 expression (500 bp) and bottom panel, β-actin (620 bp). Cells were routinely monitored for TLR6 expression and only the stably transfected cells (TLR6+) were positive for this receptor. B, Wild-type or the TLR6+ trophoblast cells were incubated with PDG at 0, 40, or 80 μg/ml for 72 h. Cell viability was then determined using the CellTiter 96 assay. Bar graph, Percentage of cell viability relative to the untreated control (0). Treatment with PDG significantly reduced the wild-type trophoblast cell viability in a dose-dependent manner (*, p < 0.05; **, p < 0.001). 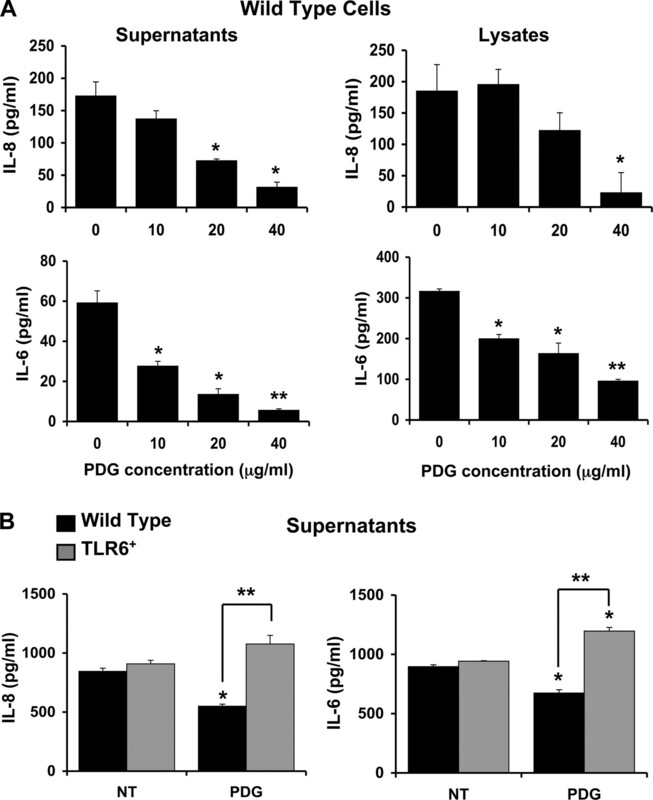 Expression of TLR6 significantly inhibited the effect of PDG on trophoblast cell viability when compared with the responses of the wild-type cells (**, p < 0.001). Expression of TLR6 inhibits PDG-induced trophoblast apoptosis. 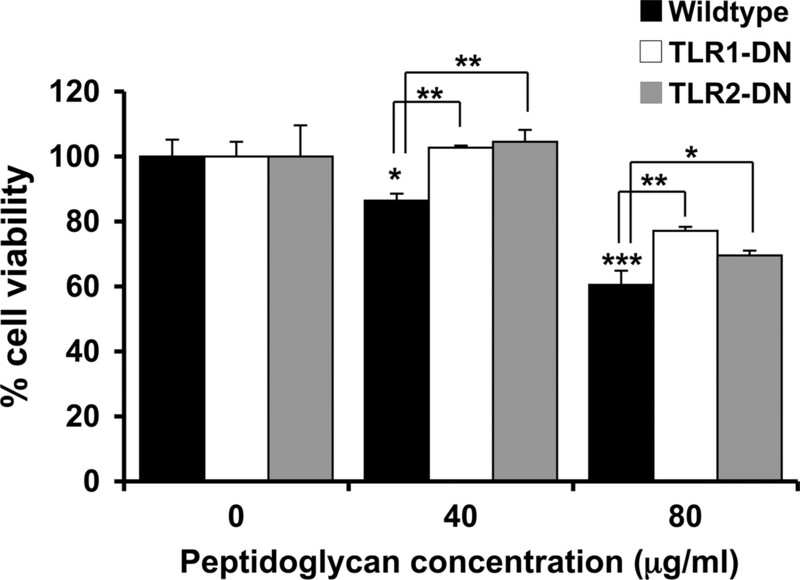 Wild-type trophoblast cells or TLR6+ trophoblast cells were incubated with either no treatment or PDG at 40 μg/ml for 48 h, after which cell lysates were prepared and caspase activity was determined. Bar graph, The percent increase in caspase 3, caspase 8, and caspase 9 activity induced by PDG relative to the untreated control. 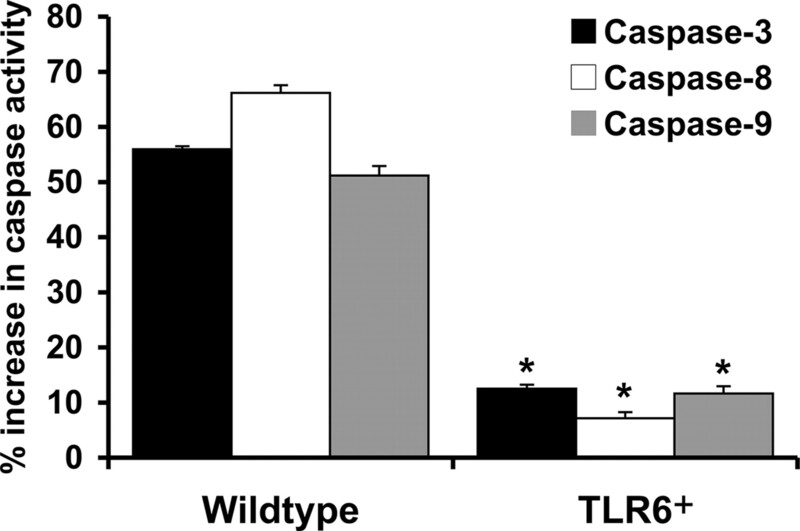 Expression of TLR6 significantly inhibited activation of caspase 3, caspase 8, and caspase 9 induced by PDG when compared with the response of the wild-type cells (*, p < 0.001). Expression of TLR6 reverses the inhibitory effect of PDG on trophoblast cytokine production. Wild-type first trimester trophoblast cells (HTR8 and 3A) and the trophoblast cells stably transfected with TLR6 (TLR6+) were treated with PDG at 0, 10, 20, or 40 μg/ml, after which cell-free supernatants were collected and assayed for IL-8 and IL-6 using the Beadlyte multiplex assay. A, Bar graphs show that in the HTR8 wild-type cells IL-8 and IL-6 content (lysates) and secretion (supernatants) was significantly reduced after 24 h of treatment with PDG in a dose-dependent manner. *, p < 0.05; **, p < 0.001 relative to the untreated control (0). B, After incubation with either no treatment (NT) or PDG (40 μg/ml) for 48 h, IL-8 and IL-6 secretion was inhibited in the wild-type 3A cells; however, in the TLR6+ cells, IL-8 and IL-6 secretion was significantly increased after PDG treatment (*, p < 0.05; **, p < 0.005). Expression of TLR6 results in PDG-induced NF-κB activation in trophoblast cells. Wild-type trophoblast cells or the TLR6+ trophoblast cells were transiently transfected with pBII-LUC. Cells were then treated with or without PDG (40 μg/ml) for 0 and 30 min, after which cell lysates were collected and assayed for NF-κB activity using the luciferase assay. Bar graph, PDG-induced NF-κB activity in RLU after normalization against the untreated controls.